Once we’ve created our graph models – essentially a description of the data and insights that are in the graph – we need to make these models available for teams across the business. We need the people who are building applications – the developers and their business users – to understand what’s in the network and what it says about the business, so they can use both data and insight in their applications. They might want to build a recommendation system based on a person’s network of interests, personalize a Web UI according to their interaction preferences, recruit people with influence for an advocacy program or people with expertise for a new project, measure employee engagement across the business or customer engagement across their digital touch points. All these capabilities require the human network and none of them want to have to try to build the network from scratch. 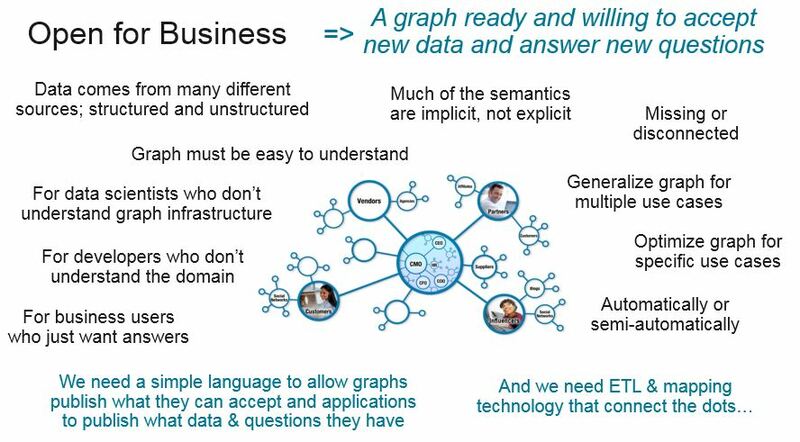 We also need the people who have data to understand how their data could add value to the graph and have easy ways to map their own business semantics into the existing graph semantics. We also need easy ways to allow them to extend the graph to maximize the value of their data. Just imagine I’ve built a network from social, collaboration, and project data which I use to measure employee engagement, expertise, and influence. I am then approached by the team responsible for the corporate learning system. They have really interesting data about the classes that employees have taken, topics covered, the course work completed, test results achieved, and the communities of interest around these classes. They would love their data to contribute to the expertise component of the network and would love to better understand the correlation between learning and outcome. For example; if someone takes a course in presentation skills does this result in them doing more presentations and getting better feedback? It needs to be really easy for data providers to map their data to what we already have (communities, topics, … and all related verbs), add new semantics for what we don’t have (class, test, …), and tune the semantics we do have (is “complete a project” a variation of “complete coursework”? ).